Louisville, Kentucky (October 27, 2016) – Angel’s Envy®, the super-premium Kentucky Straight bourbon of uncompromising character and quality, will officially open its distillery to the public for guided tours, beginning Saturday, November 19. Online reservations, which are required, are being accepted beginning today at www.angelsenvy.com. Admission is $15 per person and includes a tasting. Kentucky residents can also enter for the chance to get a first look at the new distillery through the Oaken Ticket Sweepstakes. Angel’s Envy will host ten lucky Kentuckians (and one guest each) to receive a complimentary, personal guided tour of the new facility on Saturday, November 19th at 10 a.m. with Wes Henderson, Co-Founder/Chief Innovation Officer at Louisville Distilling Company, LLC. To be eligible, entrants must be residents of Kentucky and 25 years of age. Winners will be notified by Angel’s Envy. For full contest rules and to enter the drawing, please visit www.angelsenvy.com. Located at 500 E. Main Street at Jackson, (the former Vermont American Building), the new state-of-the-art facility will be the first full-production distillery in downtown Louisville. After breaking ground in 2013, the $27 million facility will serve as the home of all Angel’s Envy operations (from milling of grains to blending and bottling on site), as well as a bar and gift shop. The Angel’s Envy Distillery will be open for tours on Mondays and Wednesday through Saturday from 10:00am to 5:00pm and on Sundays, from 1:00 to 5:00pm. Tours will not be available on Tuesdays. 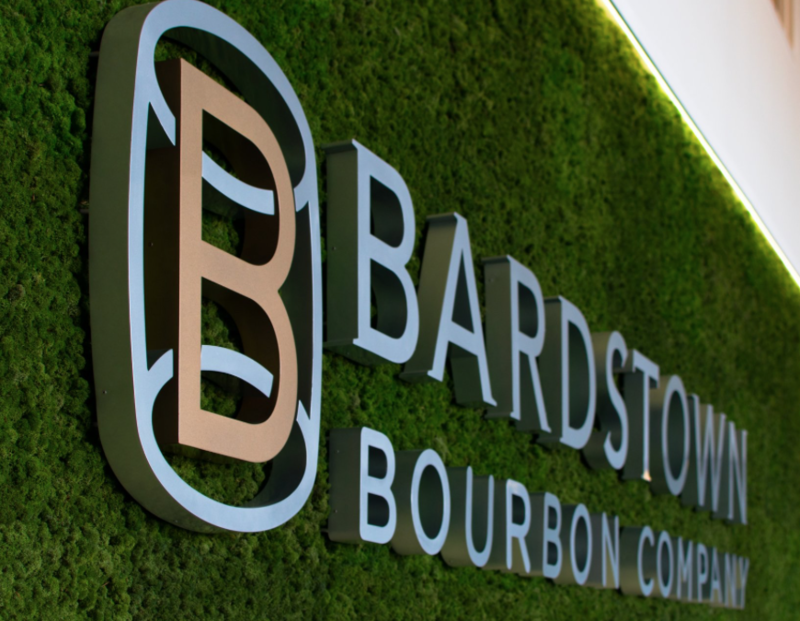 Bardstown, KY (October 17, 2016) –The Bardstown Bourbon Company (BBCo), the largest new whiskey distillery in the United States, announced today that Constellation Brands acquired a minority stake in the company. This strategic opportunity provides BBCo with a strong platform to develop new brands and create a long-term supply of authentic, Kentucky whiskey, bourbon, and rye. 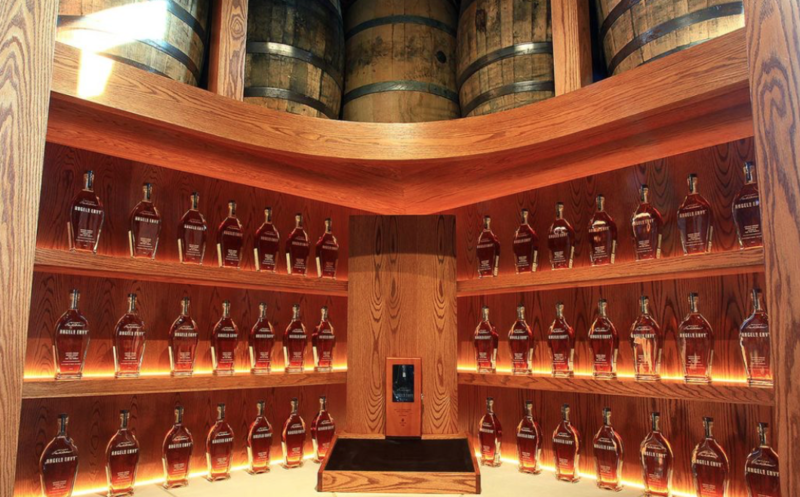 The Bardstown Bourbon Company recently developed a unique space in the American whiskey market with a first-of-its-kind Collaborative Whiskey, Bourbon, and Rye Distilling Program, which promises to expand the explosive growth of the craft distilling industry. Led by Bourbon Hall of Fame Master Distiller, Steve Nally – a 40-year veteran of the spirits industry and the former Master Distiller of Maker’s Mark – BBCo offers one of the most experienced whiskey-distilling production teams in the industry, with an average of 15+ years of experience working on world-class whiskey brands. BBCo began commercial production in September 2016 and recently announced that it was already preparing to expand its current 1.5 million proof gallon capacity based on the success of the Collaborative Distilling Program. Over time, capacity will be expanded to 6 million proof gallons within the current design. Set on 100 acres of active farmland and adjacent to the Bluegrass Parkway, BBCo’s Napa Valley style destination experience, features a unique and transparent educational experience, high-end tours and tastings, integrated visitors center and event space. The Bardstown Bourbon Company will continue to operate independently and announced that Peter Loftin, entrepreneur and investor, was named Chairman of the Board of Directors for the Bardstown Bourbon Company. Constellation Brands (NYSE: STZ and STZ.B) is a leading international producer and marketer of beer, wine and spirits with operations in the U.S., Canada, Mexico, New Zealand and Italy. Constellation is a Fortune 500® company and one of the top performing stocks in the S&P 500 Consumer Staples Index. Constellation is the No. 3 beer company in the U.S. with high-end, iconic imported brands such as Corona Extra, Corona Light, Modelo Especial, ModeloNegra and Pacifico. The company’s beer portfolio also includes Ballast Point, one of the most awarded craft brewers in the U.S. In addition, Constellation is the world’s leader in premium wine, selling great brands that people love, including Robert Mondavi, Clos du Bois, Kim Crawford, Meiomi, Mark West, Franciscan Estate, Ruffino and Jackson-Triggs. The company’s premium spirits brands include SVEDKA Vodka and Casa Noble Tequila. Based in Victor, N.Y., the company believes that industry leadership involves a commitment to brand building, our trade partners, the environment, our investors and to consumers around the world who choose our products when celebrating big moments or enjoying quiet ones. Founded in 1945, Constellation has grown to become a significant player in the beverage alcohol industry with more than 100 brands in its portfolio, sales in approximately100 countries, about 40 facilities and approximately 9,000 talented employees. We express our company vision: to elevate life with every glass raised. To learn more, visit www.cbrands.com. Louisville, Kentucky (October 13, 2016) – Louisville Distilling Company is proud to announce the limited-edition release of the critically acclaimed Angel’s Envy™ Cask Strength Finished in Port Wine Barrels. The expression is now available in select markets: AZ, CA, CO, FL, GA, IL, IN, KY, MA, MI, MO, NJ, NV, NY, OH, OR, PA, TN, TX, WA, and Washington, DC. Each year, Angel’s Envy selects a handful of barrels exceptional enough for the Cask Strength’s lengthy finishing process. Previous releases have all quickly sold out. Named “best spirit in the world” by F. Paul Pacult’s Spirit Journal in the June 2013 edition, Cask Strength shared top honors with a 25-year-old single malt whisky that sold for nearly twice the price. In his review, Pacult awarded the brand five stars – his highest recommendation – noting, “this masterpiece deserves a sixth rating star.” The 2015 expression was also awarded five stars by Pacult in the 2016 Spirit Journal. Angel’s Envy begins as a super-premium whiskey of uncompromising character and quality, aged up to seven years to the perfect level of richness and maturity. But only a few of those barrels meet the brand’s incredibly high Cask Strength standards. These hand-selected barrels are then blended and receive a lengthier finishing process in Portuguese port wine casks. The suggested retail price for a 750ml bottle, which may vary by market, is $179.99. Each year, the proof varies based on the barrels selected. The 2016 release is 124.6-proof or 62.3% ABV, so you might want to consider sipping Cask Strength with a dash of water to release some of the deeper flavor nuances. Located in downtown Louisville on the corner of Main Street and Jackson, the Angel’s Envy distillery is bringing the great Kentucky bourbon-making tradition back to the city. The new craft distillery and brand experience center will make a great starting point for the Bourbon Trail and be open to the public for guided tours. Louisville Distilling Company expects the new distillery to be up and running mid-fall, 2016. 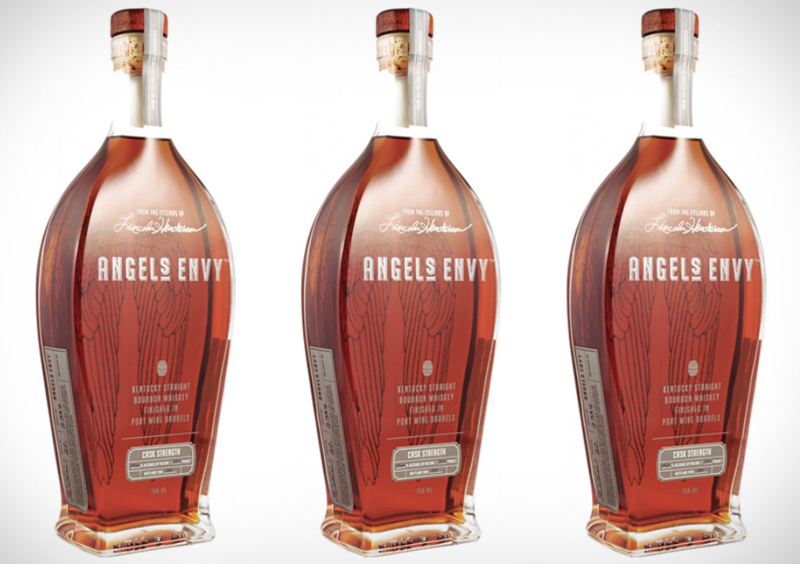 Louisville Distilling Company LLC is the proud producer of the highly celebrated Angel’s Envy Kentucky Straight Bourbon Whiskey Finished in Port Wine Barrels. The artisan bourbon, which is hand-blended in small batches of 8-12 barrels and allowed to develop naturally, is the culmination of the late Master Distiller Lincoln Henderson’s storied career. The award-winning flagship Expression, which is available across the U.S., earned 98/100 points from Wine Enthusiast magazine – the highest-ever rating for a bourbon. The Company also offers Angel’s Envy Rye, which is finished in Caribbean rum casks, and Angel’s Envy Cask Strength, which F. Paul Pacult of Spirit Journal named the “Best Spirit in the World” in 2013. Each expression exhibits a passion for experimenting outside of conventional norms and producing unique whiskey steeped in tradition, but finished with a twist. Angel’s Envy 2016. Heaven Can Wait. Please Drink Responsibly. Available for individual purchase at restaurant and retail locations throughout American Cheese Month, the Midwestern cheeses will also be featured in a special American Artisans Gift Collection ($74.99), cheese plates and signature dishes available at both Bar Pastoral (Lake View) and Appellation® Wine Bar & Restaurant (Andersonville). Additionally, both restaurants will unveil new fall menus later this weekend, which embrace the flavors of the season, including the Di Stefano Burrata with marinated summer squash and chili basil honey at Appellation and cider mussels and caramel apple cocktails with cheddar at Bar Pastoral. Appellation, which is committed to showcasing unique and inspired works from local artists, will also unveil a special installation of its seasonally rotating art collection to coincide with Andersonville Arts Weekend (October 14-16). The Wine Bar & Restaurant is thrilled to display the “One Can Dream” series created by internationally acclaimed artist, Darren Jones. To mark the occasion, Appellation will host a complimentary wine and cheese reception on Saturday, October 15 from 4:00 to 6:00 p.m. that’s open to the public. Jones’ work is featured in galleries and private collections in over 50 countries across North America, Europe, Australia and the Middle East. He is proud to call Chicago home and his work can also be seen in episodes of NBC-TV’s Chicago Fire and Chicago PD. His Appellation collection will be on display in the restaurant through January 2017. Founded in 2004 by Ken Miller and Greg O’Neill, Pastoral Artisan Cheese, Bread & Wine is a group of national award-winning neighborhood cheese, specialty food and wine shops offering the highest quality, cut-to-order domestic and international specialty cheeses, freshly baked breads, perfectly chosen accompaniments and small production wines, along with hand-crafted, cheese-loving beers and spirits. Pastoral also offers custom gift collections, gourmet sandwiches and salads, picnics and catering. Pastoral is committed to providing the highest level of service and education for customers, striving to make shopping for and consuming artisan goods enlightening, approachable, fun and delicious. Pastoral welcomes customers at four Chicago store locations, and ships nationwide at www.pastoralartisan.com. The Specialty Food Association named Pastoral “Outstanding Retailer of the Year” in 2007 and 2012. The Company’s first restaurant, Bar Pastoral, opened in 2012 and is an award winning, Michelin Guide recommended cheese & wine bistro located in Lakeview. In 2015, Pastoral opened Appellation, a 75-seat bistro serving food and wine with a sense of place in Andersonville. Bar Pastoral (2947 N. Broadway Street), serves dinner daily and brunch on the weekends. For more information please call: 773.472.4781. Appellation, (5212 N. Clark Street), serves lunch and dinner during the week, as well as brunch and dinner on weekends. For more information, please call: 773.358.7181. The American Cheese Society (ACS) is the leading organization supporting the understanding, appreciation, and promotion of artisan, farmstead, and specialty cheeses produced in the Americas. At nearly 1,700 members strong, ACS provides advocacy, education, business development, and networking opportunities for cheesemakers, retailers, enthusiasts, and extended industry. ACS strives to continually raise the quality and availability of cheese in the Americas.